Cable lacing is a method for tying wiring harnesses and cable looms, traditionally used in telecommunication, naval, and aerospace applications. 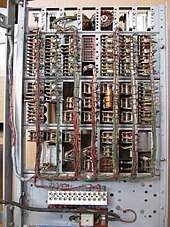 This old cable management technique, taught to generations of linemen, is still used in some modern applications since it does not create obstructions along the length of the cable, avoiding the handling problems of cables groomed by plastic or hook-and-loop cable ties. Cable lacing uses a thin cord, traditionally made of waxed linen, to bind together a group of cables using a series of running lockstitches. Flat lacing tapes made of modern materials such as nylon, polyester, Teflon, fiberglass, and Nomex are also available with a variety of coatings to improve knot holding. The lacing begins and ends with a whipping or other knot to secure the free ends. 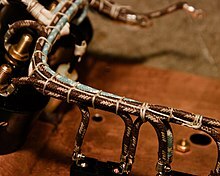 Wraps are spaced relative to the overall harness diameter to maintain the wiring in a tight, neat bundle, and the ends are then neatly trimmed. In addition to continuous or running lacing, there are a variety of lacing patterns used in different circumstances. In some cases stand-alone knots called spot ties are also used. For lashing large cables and cable bundles to support structures in telecommunications applications, there are two named cable lacing styles: the "Chicago stitch" and "Kansas City stitch". Some organizations have in-house standards to which cable lacing must conform, for example NASA specifies its cable lacing techniques in chapter 9 of NASA-STD-8739.4. This style of continuous lacing, also called "marline hitching", is based on a series of overhand knots. A series of half-hitches, while visually similar, is not recommended for this application. Spot ties formed with a clove hitch topped by a reef knot made in modern Nomex lacing tape. A surgeon's knot is an acceptable substitute for the reef knot. A variety of lacing techniques are visible on the cabling of the NASA Mars Exploration Rover Spirit and its lander. ^ "Cable Sewing Knots", Popular Mechanics, 7 (5): 550, May 1905, ISSN 0032-4558, Every lineman should know how to sew these knots. ^ Gudebrod, Inc. "Braid Lacing Tape". Archived from the original on December 1, 2007. Retrieved 2008-07-08. ^ Matisoff, Bernard S. (1987). Wiring and Cable Designer's Handbook. Summit, PA: TAB Books. pp. 93–106. ISBN 0-8306-2720-0. ^ Qwest Corporation. "Qwest Corporation Technical Publication - Telecommunications Equipment Installation Guidelines" (PDF). pp. 5–19 — 5-24. Retrieved 2008-07-08. ^ See "External Links" section for these documents. ^ Bureau of Naval Weapons (1962). "Workmanship and Design Practices for Electronic Equipment". pp. 7–9–7–14. Retrieved 2009-06-26. ^ "Cable and Harness - General Requirements". NASA. 5 April 2002. Wikimedia Commons has media related to Cable lacing. "Workmanship Standards Pictorial Reference for NASA-STD-8739". NASA. Archived from the original on 2009-07-12. Online excerpt from Electronic Installation Practices Manual (1951) , "Chapter 9, Cabling"
This page was last edited on 19 September 2018, at 21:41 (UTC).